Fish ball recipes are the fish recipe that the fish is made balls after removing the bones. As these balls are full of fish and bread mix with spices and then fried with vegetable oil, these become very healthy recipe and tasty as well. The balls make a very good snack with the afternoon tea, or some french fries may be added with the snack. Preparation and cooking of the fish ball are very easy. The fish needs to be boiled and then its fish part is to be separated from the bone. The smash fish mixed with potato makes the round shaped balls and then fried. Boil fish and remove bones. Mash boiled fish. Boil potato and mash it. Heat oil in a pan and fry onion slice until golden brown. Soak bread pieces in the water for 2 to 3 minutes. Then squeeze water from the bread pieces. Add mashed potato, bread slice, fried onion, chili, egg, breadcrumb, and salt to the mashed fish. Make a ball of your desired size. Heat oil in a non-stick frying pan. Fry each ball until brown. Fish ball is ready to serve. Serve it with sauce or salad. Kopta is the process of making balls by the original ingredient. Fish Kofta curry means the curry, which is made of fish balls. 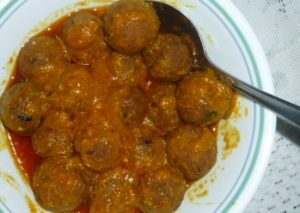 As the balls do not contain any bone and the fish is mixed with bread and other spices prior to making the balls, those become very tasty and also easy to eat. In normal cases, eating of fishes is a little bit difficult because of the presence of bones. Kopta is thus more favorable to those avoid fish with thin bones. Many fishes are used as the main ingredient of Kofta curry. Here, in this recipe carp fish is used mainly because of the larger chunk of fish availability on the carp body. However, the fish needs to be boiled before separating bones. Soak bread pieces in the water for 2 to 3 minutes. Then squeeze water from the bread pieces. Add mashed potato, bread slice, fried onion, chili, egg, breadcrumb, and salt to the mashed fish. Make a ball as your desired size. Heat oil in a non-stick frying pan. Fry each ball until brown. Heat oil in another pan over medium heat. Add chili powder, cumin powder, ginger paste, hot spices powder, and salt. Beat yogurt and add the ingredients. Add sauce. After blooming add all fish ball into the gravy. After 5 minutes turn off the burner. Fish ball recipes ball curry is ready to serve. Serve it with pulao, biryani, white rice or chapatti or paratha. 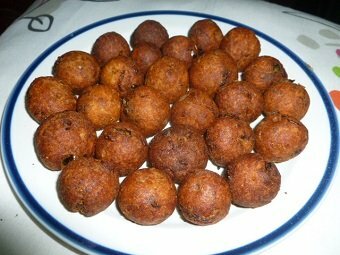 If you like my fish ball recipes please share the recipe with your family and friends.